This article is about the historical style. For the contemporary style, see New Classical architecture. Neoclassical architecture is an architectural style produced by the neoclassical movement that began in the mid-18th century. In its purest form, it is a style principally derived from the architecture of classical antiquity, the Vitruvian principles, and the work of the Italian architect Andrea Palladio. In form, neoclassical architecture emphasizes the wall rather than chiaroscuro and maintains separate identities to each of its parts. The style is manifested both in its details as a reaction against the Rococo style of naturalistic ornament, and in its architectural formulae as an outgrowth of some classicising features of the Late Baroque architectural tradition. Neoclassical architecture is still designed today, but may be labelled New Classical Architecture for contemporary buildings. In Central and Eastern Europe, the style is usually referred to as Classicism (German: Klassizismus, Russian: Классицизм), while the newer revival styles of the 19th century until today are called neoclassical. Intellectually, neoclassicism was symptomatic of a desire to return to the perceived "purity" of the arts of Rome, to the more vague perception ("ideal") of Ancient Greek arts and, to a lesser extent, 16th-century Renaissance Classicism, which was also a source for academic Late Baroque architecture. Many early 19th-century neoclassical architects were influenced by the drawings and projects of Étienne-Louis Boullée and Claude Nicolas Ledoux. The many graphite drawings of Boullée and his students depict spare geometrical architecture that emulates the eternality of the universe. There are links between Boullée's ideas and Edmund Burke's conception of the sublime. Ledoux addressed the concept of architectural character, maintaining that a building should immediately communicate its function to the viewer: taken literally such ideas give rise to "architecture parlante". Palladian revival: Stourhead House, designed by Colen Campbell and completed in 1720. The design is based on Palladio's Villa Emo. A return to more classical architectural forms as a reaction to the Rococo style can be detected in some European architecture of the earlier 18th century, most vividly represented in the Palladian architecture of Georgian Britain and Ireland. The baroque style had never truly been to the English taste. Four influential books were published in the first quarter of the 18th century which highlighted the simplicity and purity of classical architecture: Vitruvius Britannicus (Colen Campbell 1715), Palladio's Four Books of Architecture (1715), De Re Aedificatoria (1726) and The Designs of Inigo Jones... with Some Additional Designs (1727). The most popular was the four-volume Vitruvius Britannicus by Colen Campbell. The book contained architectural prints of famous British buildings that had been inspired by the great architects from Vitruvius to Palladio. At first the book mainly featured the work of Inigo Jones, but the later tomes contained drawings and plans by Campbell and other 18th-century architects. Palladian architecture became well established in 18th-century Britain. At the forefront of the new school of design was the aristocratic "architect earl", Richard Boyle, 3rd Earl of Burlington; in 1729, he and William Kent, designed Chiswick House. This House was a reinterpretation of Palladio's Villa Capra, but purified of 16th century elements and ornament. This severe lack of ornamentation was to be a feature of the Palladianism. In 1734 William Kent and Lord Burlington designed one of England's finest examples of Palladian architecture with Holkham Hall in Norfolk. The main block of this house followed Palladio's dictates quite closely, but Palladio's low, often detached, wings of farm buildings were elevated in significance. This classicising vein was also detectable, to a lesser degree, in the Late Baroque architecture in Paris, such as in Perrault's east range of the Louvre. This shift was even visible in Rome at the redesigned façade for S. Giovanni in Laterano. The shift to neoclassical architecture is conventionally dated to the 1750s. It first gained influence in England and France; in England, Sir William Hamilton's excavations at Pompeii and other sites, the influence of the Grand Tour and the work of William Chambers and Robert Adam, was pivotal in this regard. In France, the movement was propelled by a generation of French art students trained in Rome, and was influenced by the writings of Johann Joachim Winckelmann. The style was also adopted by progressive circles in other countries such as Sweden and Russia. International neoclassical architecture was exemplified in Karl Friedrich Schinkel's buildings, especially the Old Museum in Berlin, Sir John Soane's Bank of England in London and the newly built White House and Capitol in Washington, D.C. of the nascent American Republic. The style was international. The Baltimore Cathedral (now the Basilica of the National Shrine of the Assumption of the Blessed Virgin Mary), which was designed by Benjamin Henry Latrobe in 1806, is considered one of the finest examples of neo-classical architecture in the world. A second neoclassic wave, more severe, more studied and more consciously archaeological, is associated with the height of the Napoleonic Empire. In France, the first phase of neoclassicism was expressed in the "Louis XVI style", and the second in the styles called "Directoire" or Empire. In the decorative arts, neoclassicism is exemplified in French furniture of the Empire style; the English furniture of Chippendale, George Hepplewhite and Robert Adam, Wedgwood's bas reliefs and "black basaltes" vases, and the Biedermeier furniture of Austria. The Scottish architect Charles Cameron created palatial Italianate interiors for the German-born Catherine II the Great in St. Petersburg. Indoors, neoclassicism made a discovery of the genuine classic interior, inspired by the rediscoveries at Pompeii and Herculaneum. These had begun in the late 1740s, but only achieved a wide audience in the 1760s, with the first luxurious volumes of tightly controlled distribution of Le Antichità di Ercolano (The Antiquities of Herculaneum). The antiquities of Herculaneum showed that even the most classicising interiors of the Baroque, or the most "Roman" rooms of William Kent were based on basilica and temple exterior architecture turned outside in, hence their often bombastic appearance to modern eyes: pedimented window frames turned into gilded mirrors, fireplaces topped with temple fronts. The new interiors sought to recreate an authentically Roman and genuinely interior vocabulary. Techniques employed in the style included flatter, lighter motifs, sculpted in low frieze-like relief or painted in monotones en camaïeu ("like cameos"), isolated medallions or vases or busts or bucrania or other motifs, suspended on swags of laurel or ribbon, with slender arabesques against backgrounds, perhaps, of "Pompeiian red" or pale tints, or stone colours. The style in France was initially a Parisian style, the Goût grec ("Greek style"), not a court style; when Louis XVI acceded to the throne in 1774, Marie Antoinette, his fashion-loving Queen, brought the "Louis XVI" style to court. However, there was no real attempt to employ the basic forms of Roman furniture until around the turn of the century, and furniture-makers were more likely to borrow from ancient architecture, just as silversmiths were more likely to take from ancient pottery and stone-carving than metalwork: "Designers and craftsmen ... seem to have taken an almost perverse pleasure in transferring motifs from one medium to another". A new phase in neoclassical design was inaugurated by Robert and James Adam, who travelled in Italy and Dalmatia in the 1750s, observing the ruins of the classical world. On their return to Britain, they published a book entitled The Works in Architecture in installments between 1773 and 1779. This book of engraved designs made the Adam repertory available throughout Europe. The Adam brothers aimed to simplify the rococo and baroque styles which had been fashionable in the preceding decades, to bring what they felt to be a lighter and more elegant feel to Georgian houses. The Works in Architecture illustrated the main buildings the Adam brothers had worked on and crucially documented the interiors, furniture and fittings, designed by the Adams. From about 1800 a fresh influx of Greek architectural examples, seen through the medium of etchings and engravings, gave a new impetus to neoclassicism, the Greek Revival. There was little to no direct knowledge of Greek civilization before the middle of the 18th century in Western Europe, when an expedition funded by the Society of Dilettanti in 1751 and led by James Stuart and Nicholas Revett began serious archaeological enquiry. Stuart was commissioned after his return from Greece by George Lyttelton to produce the first Greek building in England, the garden temple at Hagley Hall (1758–59). A number of British architects in the second half of the century took up the expressive challenge of the Doric from their aristocratic patrons, including Joseph Bonomi and John Soane, but it was to remain the private enthusiasm of connoisseurs up to the first decade of the 19th century. Seen in its wider social context, Greek Revival architecture sounded a new note of sobriety and restraint in public buildings in Britain around 1800 as an assertion of nationalism attendant on the Act of Union, the Napoleonic Wars, and the clamour for political reform. It was to be William Wilkins's winning design for the public competition for Downing College, Cambridge that announced the Greek style was to be the dominant idiom in architecture. Wilkins and Robert Smirke went on to build some of the most important buildings of the era, including the Theatre Royal, Covent Garden (1808–09), the General Post Office (1824–1829) and the British Museum (1823–1848), Wilkins University College London (1826–1830) and the National Gallery (1832–1838). In Scotland, Thomas Hamilton (1784–1858), in collaboration with the artists Andrew Wilson (1780–1848) and Hugh William Williams (1773–1829) created monuments and buildings of international significance; the Burns Monument at Alloway (1818) and the (Royal) High School in Edinburgh (1823–1829). At the same time the Empire style in France was a more grandiose wave of neoclassicism in architecture and the decorative arts. Mainly based on Imperial Roman styles, it originated in, and took its name from, the rule of Napoleon I in the First French Empire, where it was intended to idealize Napoleon's leadership and the French state. The style corresponds to the more bourgeois Biedermeier style in the German-speaking lands, Federal style in the United States, the Regency style in Britain, and the Napoleonstil in Sweden. According to the art historian Hugh Honour "so far from being, as is sometimes supposed, the culmination of the Neo-classical movement, the Empire marks its rapid decline and transformation back once more into a mere antique revival, drained of all the high-minded ideas and force of conviction that had inspired its masterpieces". Neoclassicism continued to be a major force in academic art through the 19th century and beyond—a constant antithesis to Romanticism or Gothic revivals—although from the late 19th century on it had often been considered anti-modern, or even reactionary, in influential critical circles.[who?] The centres of several European cities, notably St Petersburg and Munich, came to look much like museums of Neoclassical architecture. A. Rinaldi. The White hall of the Gatchina palace. 1760s. An early example of the Italianate neoclassical interior design in Russian architecture. High neoclassicism was an international movement. Though neoclassical architecture employed the same classical vocabulary as Late Baroque architecture, it tended to emphasize its planar qualities, rather than sculptural volumes. Projections and recessions and their effects of light and shade were more flat; sculptural bas-reliefs were flatter and tended to be enframed in friezes, tablets or panels. Its clearly articulated individual features were isolated rather than interpenetrating, autonomous and complete in themselves. The L'Enfant Plan for Washington, D.C., as revised by Andrew Ellicott in 1792. Neoclassicism also influenced city planning; the ancient Romans had used a consolidated scheme for city planning for both defence and civil convenience, however, the roots of this scheme go back to even older civilizations. At its most basic, the grid system of streets, a central forum with city services, two main slightly wider boulevards, and the occasional diagonal street were characteristic of the very logical and orderly Roman design. Ancient façades and building layouts were oriented to these city design patterns and they tended to work in proportion with the importance of public buildings. Many of these urban planning patterns found their way into the first modern planned cities of the 18th century. Exceptional examples include Karlsruhe and Washington, D.C. Not all planned cities and planned neighbourhoods are designed on neoclassical principles, however. Opposing models may be found in Modernist designs exemplified by Brasília, the Garden city movement, levittowns, and new urbanism. The central courtyard of Sir William Chambers' Somerset House in London. From the middle of the 18th century, exploration and publication changed the course of British architecture towards a purer vision of the Ancient Greco-Roman ideal. James 'Athenian' Stuart's work The Antiquities of Athens and Other Monuments of Greece was very influential in this regard, as were Robert Wood's Palmyra and Baalbec. A combination of simple forms and high levels of enrichment was adopted by the majority of contemporary British architects and designers. The revolution begun by Stuart was soon to be eclipsed by the work of the Adam Brothers, James Wyatt, Sir William Chambers, George Dance, James Gandon and provincially based architects such as John Carr and Thomas Harrison of Chester. In the early 20th century, the writings of Albert Richardson were responsible for a re-awakening of interest in pure neoclassical design. Vincent Harris (compare Harris's colonnaded and domed interior of Manchester Central Reference Library to the colonnaded and domed interior by John Carr and R R Duke), Bradshaw Gass & Hope and Percy Thomas were among those who designed public buildings in the neoclassical style in the interwar period. In the British Raj in India, Sir Edwin Lutyens' monumental city planning for New Delhi marked the sunset of neoclassicism. In Scotland and the north of England, where the Gothic Revival was less strong, architects continued to develop the neoclassical style of William Henry Playfair. The works of Cuthbert Brodrick and Alexander Thomson show that by the end of the 19th century the results could be powerful and eccentric. Château de Montmusard (1765), by Charles de Wailly. The first phase of neoclassicism in France is expressed in the Louis Quinze style of architect Ange-Jacques Gabriel (Petit Trianon, 1762–68); the second phase, in the styles called Directoire and "Empire", might be characterized by Jean Chalgrin's severe astylar Arc de Triomphe (designed in 1806). In England the two phases might be characterized first by the structures of Robert Adam, the second by those of Sir John Soane. The interior style in France was initially a Parisian style, the "Goût grec" ("Greek style") not a court style. Only when the young king acceded to the throne in 1774 did Marie Antoinette, his fashion-loving Queen, bring the Louis XVI style to court. From about 1800 a fresh influx of Greek architectural examples, seen through the medium of etchings and engravings, gave a new impetus to neoclassicism that is called the Greek Revival. Although several European cities — notably St Petersburg, Athens, Berlin and Munich — were transformed into veritable museums of Greek revival architecture, the Greek revival in France was never popular with either the State or the public. What little there was, started with Charles de Wailly's crypt in the church of St Leu-St Gilles (1773–80), and Claude Nicolas Ledoux's Barriere des Bonshommes (1785–89). First-hand evidence of Greek architecture was of very little importance to the French, due to the influence of Marc-Antoine Laugier's doctrines that sought to discern the principles of the Greeks instead of their mere practices. It would take until Labrouste's Neo-Grec of the second Empire for the Greek revival to flower briefly in France. After the establishment of the Kingdom of Greece in 1832, the architecture of Greece was mostly influenced by the Neoclassical architecture. For Athens, the first King of Greece, Otto I, commissioned the architects Stamatios Kleanthis and Eduard Schaubert to design a modern city plan. The Old Royal Palace was the first important public building to be built, between 1836 and 1843. Later in the mid and late 19th century, Theophil von Hansen and Ernst Ziller took part in the construction of many neoclassical buildings. Theophil von Hansen designed his first building, the National Observatory of Athens and two of the three contiguous buildings forming the so-called "Athens Classical Trilogy", namely the Academy of Athens (1859) and the National Library of Greece (1888), the third building of the trilogy being the National and Capodistrian University of Athens (1843), which was designed by his brother Christian Hansen. Also he designed the Zappeion Hall (1888). Ernst Ziller also designed many private mansions in the centre of Athens which gradually became public, usually through donations, such the mansion of Heinrich Schliemann, Iliou Melathron (1880). The city of Nauplio is also an important example of Neoclassical Architecture along with the island of Poros. The earliest examples of neoclassical architecture in Hungary may be found in Vác. In this town the triumphal arch and the neoclassical façade of the baroque Cathedral were designed by the French architect Isidor Marcellus Amandus Ganneval (Isidore Canevale) in the 1760s. Also the work of a French architect Charles Moreau is the garden façade of the Esterházy Palace (1797–1805) in Kismarton (today Eisenstadt in Austria). The two principal architects of Neoclassicism in Hungary were Mihály Pollack and József Hild. Pollack's major work is the Hungarian National Museum (1837–1844). Hild is famous for his designs for the Cathedral of Eger and Esztergom. The Reformed Great Church of Debrecen is an outstanding example of the many Protestant churches that were built in the first half of the 19th century. This was the time of the first iron structures in Hungarian architecture, the most important of which is the Chain Bridge (Budapest) by William Tierney Clark. Neoclassical architecture was introduced in Malta in the late 18th century, during the final years of Hospitaller rule. Early examples include the Bibliotheca (1786), the De Rohan Arch (1798) and the Hompesch Gate (1801). However, neoclassical architecture only became popular in Malta following the establishment of British rule in the early 19th century. In 1814, a neoclassical portico decorated with the British coat of arms was added to the Main Guard building so as to serve as a symbol of British Malta. Other 19th century neoclassical buildings include the Monument to Sir Alexander Ball (1810), RNH Bighi (1832), St Paul's Pro-Cathedral (1844), the Rotunda of Mosta (1860) and the now-destroyed Royal Opera House (1866). Neoclassicism gave way to other architectural styles by the late 19th century. Few buildings were built in the neoclassical style during the 20th century, such as the Domvs Romana museum (1922), and the Courts of Justice building in Valletta (1965–71). The influx of wealth from the discovery of gold in the South Island region of Otago in 1861 led to the rapid growth of the cities of Dunedin and Christchurch and commercial towns such as Oamaru and Timaru. The combination of new wealth and commerce and a sudden increase of population from overseas prospectors led to a boom in imposing architecture, often built using hard basalt rock faced with the easily sculpted but less durable local limestone, Oamaru stone. Understandably, these centres, on the east coast in the southern and central South Island, saw a substantial number of neoclassical building designed and erected, with principal architects including R. A. Lawson, F. W. Petre, and Louis Boldoni. Major neoclassical buildings in southern New Zealand include Petre's renaissance-inspired Christchurch Basilica, Palladian-inspired St Patrick's Basilica in Oamaru, and the neo-Byzantine Sacred Heart Basilica in Timaru; George Troup's Flemish-influenced Dunedin Railway Station; and civic and commercial buildings by Lawson in Dunedin and Oamaru. Both Lawson and Christchurch-based architect Benjamin Mountfort frequently mixed Neoclassical and Neo-Gothic elements in their designs. The centre of Polish Neoclassicism was Warsaw under the rule of the last Polish king Stanisław August Poniatowski. Vilnius University was another important centre of the Neoclassical architecture in Europe, led by notable professors of architecture Marcin Knackfus, Laurynas Gucevicius and Karol Podczaszyński. The style was expressed in the shape of main public buildings, such as the University's Observatory, Vilnius Cathedral and the town hall. The best-known architects and artists, who worked in Polish–Lithuanian Commonwealth were Dominik Merlini, Jan Chrystian Kamsetzer, Szymon Bogumił Zug, Jakub Kubicki, Antonio Corazzi, Efraim Szreger, Chrystian Piotr Aigner and Bertel Thorvaldsen. Russian Orthodox church of Our Lady of Kazan near Lake Baikal in Siberia (built in 1816). In the Russian Empire at the end of the 19th century, neoclassical architecture was equal to Saint Petersburg architecture because this style was specific for a huge number of buildings in the city. In the Soviet Union (1917–1991), neoclassical architecture was very popular among the political elite, as it effectively expressed state power and a vast array of neoclassical building was erected all over the country. Soviet neoclassical architecture was exported to other socialist countries of the Eastern Bloc, as a gift from the Soviet Union. Examples of this include the Palace of Culture and Science, Warsaw, Poland and the Shanghai International Convention Center in Shanghai, China. Spanish Neoclassicism was exemplified by the work of Juan de Villanueva, who adapted Burke's theories of beauty and the sublime to the requirements of Spanish climate and history. 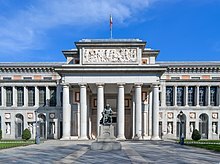 He built the Prado Museum, that combined three functions — an academy, an auditorium and a museum — in one building with three separate entrances. This was part of the ambitious program of Charles III, who intended to make Madrid the Capital of the Arts and Sciences. Very close to the museum, Villanueva built the Astronomical Observatory. He also designed several summer houses for the kings in El Escorial and Aranjuez and reconstructed the Major Square of Madrid, among other important works. Villanueva´s pupils expanded the Neoclassical style in Spain. Neoclassical architecture was the preferred style by the leaders of the National Socialist movement in the Third Reich, especially admired by Adolf Hitler himself. Hitler commissioned his favourite architect, Albert Speer, to plan a re-design of Berlin as a city comprising imposing neoclassical structures, which would be renamed as Welthauptstadt Germania, the centrepiece of Hitler's Thousand Year Reich. These plans never came to fruition due to the eventual downfall of Nazi Germany and the suicide of its leader. The Lincoln Memorial, an early 20th century example of American Renaissance neoclassical architecture. In the new republic, Robert Adam's neoclassical manner was adapted for the local late 18th and early 19th-century style, called "Federal architecture". One of the pioneers of this style was English-born Benjamin Henry Latrobe, who is often noted as one of America's first formally trained professional architects and the father of American architecture. The Baltimore Basilica, the first Roman Catholic cathedral in the United States, is considered by many experts to be Latrobe's masterpiece. The widespread use of neoclassicism in American architecture, as well as by French revolutionary regimes, and the general tenor of rationalism associated with the movement, all created a link between neoclassicism and republicanism and radicalism in much of Europe. The Gothic Revival can be seen as an attempt to present a conservative alternative to neoclassicism. In later 19th-century American architecture, neoclassicism was one expression of the American Renaissance movement, ca 1880–1917. Its later manifestation was in Beaux-Arts architecture (1885–1920), and its very last, large public projects in the United States include the Lincoln Memorial (1922), the National Gallery in Washington, D.C. (1937), and the American Museum of Natural History's Roosevelt Memorial (1936). Today, there is a small revival of Classical Architecture as evidenced by the groups such as The Institute of Classical Architecture and Classical America. The School of Architecture at the University of Notre Dame, currently teaches a fully Classical curriculum. After a lull during the period of modern architectural dominance (roughly post-World War II until the mid-1980s), neoclassicism has seen somewhat of a resurgence. This rebirth can be traced to the movement of New Urbanism and postmodern architecture's embrace of classical elements as ironic, especially in light of the dominance of Modernism. While some continued to work with classicism as ironic, some architects such as Thomas Gordon Smith, began to consider classicism seriously. While some schools had interest in classical architecture, such as the University of Virginia, no school was purely dedicated to classical architecture. In the early 1990s a program in classical architecture was started by Smith and Duncan Stroik at the University of Notre Dame that continues successfully. Programs at the University of Miami, Andrews University, Judson University and The Prince's Foundation for Building Community have trained a number of new classical architects since this resurgence. Today one can find numerous buildings embracing neoclassical style, since a generation of architects trained in this discipline shapes urban planning. As of the first decade of the 21st century, contemporary neoclassical architecture is usually classed under the umbrella term of New Classical Architecture. Sometimes it is also referred to as Neo-Historicism/Revivalism, Traditionalism or simply neoclassical architecture like the historical style. For sincere traditional-style architecture that sticks to regional architecture, materials and craftsmanship, the term Traditional Architecture (or vernacular) is mostly used. The Driehaus Architecture Prize is awarded to major contributors in the field of 21st century traditional or classical architecture, and comes with a prize money twice as high as that of the modernist Pritzker Prize. In the United States various contemporary public buildings are built in neoclassical style, with the 2006 Schermerhorn Symphony Center in Nashville being an example. In Britain a number of architects are active in the neoclassical style. Two new university Libraries, Quinlan Terry's Maitland Robinson Library at Downing College and ADAM Architecture's Sackler Library illustrate that the approach taken can range from the traditional, in the former case, to the unconventional, in the latter case. Recently, Prince Charles came under controversy for promoting a classically designed development on the land of the former Chelsea Barracks in London. Writing to the Qatari Royal family (who were funding the development through the property development company Qatari Diar) he condemned the accepted modernist plans, instead advocating a classical approach. His appeal was met with success and the plans were withdrawn. A new design by architecture firm Dixon Jones is currently being drafted. ^ "Neoclassical architecture". Encyclopedia Britannica. Retrieved 7 July 2017. ^ "Neoclassical Architecture (1640-1850)". www.visual-arts-cork.com. Retrieved 7 July 2017. ^ Though Giles Worsley detects the first Grecian influenced architectural element in the windows of Nuneham Park from 1756, see Giles Worsley, "The First Greek Revival Architecture", The Burlington Magazine, Vol. 127, No. 985 (April 1985), pp. 226–229. ^ "Bibliotheca" (PDF). National Inventory of the Cultural Property of the Maltese Islands. 28 December 2012. Archived from the original (PDF) on 6 December 2015. ^ "Rohan Gate, Żebbuġ". Times of Malta. 11 December 2012. Archived from the original on 4 December 2015. ^ Bötig, Klaus (2011). Malta, Gozo. Con atlante stradale (in Italian). EDT srl. p. 54. ISBN 9788860407818. ^ "Architecture in Malta under the British". culturemalta.org. Archived from the original on 7 October 2015. ^ "Domvs Romana". Heritage Malta. Archived from the original on 5 January 2015. ^ "The Courts". The Judiciary – Malta. Archived from the original on 6 January 2015. ^ "The Institute of Classical Architecture & Art". Classicist.org. Retrieved 11 June 2011. ^ "University of Notre Dame School of Architecture at the". Architecture.nd.edu. Archived from the original on 9 July 2012. Retrieved 11 June 2011. ^ Booth, Robert (25 June 2010). "Prince Charles's role in Chelsea barrack planning row 'unwelcome'". London: Guardian. Retrieved 15 January 2011. 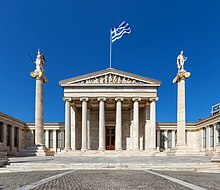 Wikimedia Commons has media related to Neoclassical architecture.